With the holidays upon us, we typically think about the things we’re grateful for. 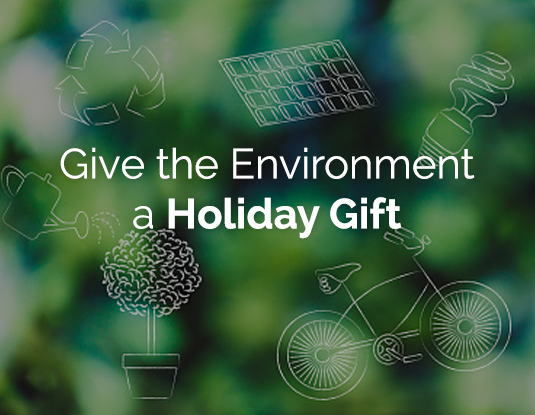 This year, why not consider a gift to our environment? These days, our environment is under increasing strain. Carbon emissions are rising, trash is gathering on land and at sea, plus bee and other populations are declining. But there’s reason for hope. More than 9,000 cities around the world have committed to the Paris Climate Agreement, which addresses the mitigation of greenhouse-gas-emissions within the United Nations. Some are even employing big data analytics to reduce their carbon footprints and cut emissions. But that’s big picture stuff. What can you and I do? Here are 9 ideas for cleaning up the environment, during the holidays and beyond. Rideshare with coworkers. Better yet, pedal your bike instead, to work or wherever. Cycling helps you reduce emissions, save money, get exercise, and enjoy getting around town. Unplug unused appliances. Many draw energy even when not in use. Of course, going solar goes further. You can cut your carbon footprint and return power back to the grid. Tidy up your community’s parks or beaches by collecting trash during your jogs, strolls, or dog walks. Join a litter-collection group. Or start your own with friends. Bring your own reusable bags when you shop. Drink from reusable water bottles, not disposable ones. And when you can, opt for minimum packing when ordering items online. Cook at home more, and order take-out less. That cuts back on wasteful to-go packaging. Or go meatless one day each week to help reduce greenhouse gasses. Experts warn that if bees go extinct, humans could soon follow. If you leave a mixture of sugar and water outdoors, bees will drink from it and replenish their energy. Wildflowers aren’t just beautiful. They also create a diverse environment in which birds and bugs thrive. Seeds are inexpensive, planting is simple, and wildflowers grow quickly. Supermarket produce can generate a huge carbon footprint by the time you get it home. So, shorten the farm-to-table distance by growing fruits, vegetables, or herbs in your own garden. Write your representative in Congress. Tell them a clean environment matters and that you plan to vote accordingly. Luckily, there are a lot of ways we make a difference and enjoy our great outdoors. Whatever you do, Mother Earth will surely thank you.